Grant Nicholas during Feeder's performance at Warwick University's Summer Party on 26 June 2011. Grantley Jonathan "Grant" Nicholas (born 12 November 1967) is a Welsh musician, and lead singer and guitarist of the rock band Feeder. Nicholas was born in Newport, South Wales, but grew up in Shirenewton, near Chepstow. He was educated at Monmouth School. He performed in public for the first time at the age of 11 at school, and gained four O-levels (now referred to as GCSEs), including an A grade in Art. In school, Nicholas played the trumpet, and was in his first band, Sweet Leaf (named after a song by Black Sabbath, who were Grant's favourite band in his school years, and the first he saw play live, at the Colston Hall in Bristol). He was promised his first guitar by his parents, as an incentive to pass his exams. He received the guitar, an Aron Les Paul copy after passing them. Grant says he didn't like the "cattle market" aspects of school and didn't work hard. His favourite bands at school included heavy metal bands such as Judas Priest and Black Sabbath. Nicholas' "signature guitar" is a 1967 Sunburst Fender Jazzmaster. In addition to this, he also owns a 1964 Silver Jazzmaster (often tuned differently when used live) and another Sunburst 59 Jazzmaster. He is using Fender Telecasters more and more and has a 73 Sunburst Fender Telecaster a 63 Black Telecaster and a Blue Standard Telecaster. His other guitars include a Cherry Red Gibson SG, a Fender Bellmaster, a Green Custom Jazzbird, a Green Jazzmaster (which he destroyed at Feeder's headline set at Download 2005 and later said he regretted it, but still has the neck to make a new guitar with), a Gibson Firebird,a custom ESP "Gibstang", a Sunburst Gibson J-200 Acoustic and a natural finish Yamaha acoustic (for recording). He uses a variety of different pedals and effects to produce the distinctive Feeder sound. His main amplifiers are: Vox AC30s, Fender Twins, Boogie and Marshall + Marshall and Orange Speaker Cabinets. After leaving school Nicholas worked as a bike courier in London. When Grant was 19. He joined a progressive rock band called Multi-Story as their singer. He released one album with the band called 'Through Your Eyes' and they disbanded soon after. The album was not given any backing by FM Records, due to the internal problems during and after recording, in which original singer Paul Ford left leading to Nicholas from local band 'Silent Partner', to be asked to join and re-record the already laid-down vocals, while re-writing some lyrics to suit his style. It was their second and final album. After Multi-Story broke up, Grant joined Welsh nine-piece Temper Temper, where he met future Feeder drummer, Jon Lee. Grant then formed electric/acoustic rock band called Rain Dancer with Jon Lee. Then the two would later go on to form a band called Reel which later was changed to Feeder. Lee joined Nicholas when he moved to London to work as a sound engineer. During these years. Grant found influence in alternative rock bands such as Nirvana, the Eels, Dinosaur Jr and Foo Fighters. He also enjoys movies such as Angel Heart and Taxi Driver. It was while in London that Nicholas learnt how to be a songwriter and formed Hum (soon to be renamed Real, Reel, then Feeder) with Lee, and Taka Hirose, who was working in London as a graphic designer. A series of Reel recordings surfaced on eBay in early 2006. In 2001 Nicholas also had success with the re-recording of "You Don't See The Signs", a collaboration with producer/rapper duo Mark B and Blade, who had released the original version as their first single. The new version, subtitled the "Grant Nicholas Remix", reached No. 23 in the United Kingdom. The band were formed whilst Nicholas was a producer, before moving to London to gain more experience. He had already met Jon Lee in Newport who moved down afterwards. They formed a band named Raindancer, who despite winning a TV slot never gained a record deal. This saw bassist John Canham part ways with the band, before Simon Blight followed soon after when they reformed as Hum, which was changed to Reel, before then changing their name once again to Real when Hirose took over bass duties in 1994. The band signed to The Echo Label in November of that year, before changing their name to Feeder, with their debut single proper "Stereoworld" reaching number 128 in the UK charts in October 1996, while the second single "Tangerine" reached number 60. The first full-length album, Polythene, was released in May 1997. Produced by Chris Sheldon, it charted at number 65 in the UK and was certified Silver for sales over 60,000 copies in 2003 when the band had already broken through (then upgraded to Gold status for 100,000 copies in 2017). Metal Hammer magazine included it in its Top 20 Albums of 1997 list at number 1. The follow-up album, Yesterday Went Too Soon, was produced by Nicholas. Released in August 1999, the album was a much quicker commercial success than its predecessor (entering the UK album chart at number 8 and certified Silver in 2001, with this being upgraded to Gold in 2003). The title track was the band's first UK Top 20 hit. Two years later, the band released their third and also breakthrough album, Echo Park. Produced by Gil Norton (Foo Fighters, Pixies, Echo and the Bunnymen and James), the album peaked at number 5 in the UK and was also certified Gold, but in its release year, before going Platinum in 2003. It contained their debut Top 10 single "Buck Rogers". In 2002, drummer Jon Lee took his own life, which saw the band keep out of the public eye, until their fourth album Comfort in Sound was nearing its completion. The first play of its lead single "Come Back Around" on the Radio 1 The Evening Session show, was the first time since Jon's death that the band made any public appearance and released new material, while a few days before this Grant was interviewed on the station, in which he spoke of their first shows without Jon. The single charted at No. 14, while the follow-up "Just the Way I'm Feeling" made the Top 10, both singles appeared on Comfort in Sound, also produced by Norton, which although charting one place lower than Echo Park, became their first Platinum seller. The album featured Mark Richardson of Skunk Anansie on drums, before he parted company with Feeder in 2009, to return to a reformed Skunk Anansie. Follow-up Pushing the Senses in 2005 (also produced by Norton) was not as successful, although it did not go Platinum, it still went Gold and charted at number 2 while also containing their third Top 10 and second top five single "Tumble and Fall", and the more notable "Feeling a Moment". 2006 saw their singles compilation, also chart at number 2 but went Platinum. To date this is the last Feeder album to go Top 5 or be certified, although their next three albums Silent Cry, Renegades and Generation Freakshow, with the last two being self-released on Big Teeth Music all charted in the Top 20. All of these were produced by Nicholas, although Chris Sheldon also produced the latter. In early 2014, Grant Nicholas announced via social media that he was recording a solo album. The song "Soul Mates" premiered on the Dermot O'Leary show on Radio 2 on Saturday May 31. The same track was made available for a limited time as a free download. His debut solo album Yorktown Heights was released on 11 August 2014, via Popping Candy, although in Japan it was released a few months earlier on Victor. Yorktown Heights was produced, written and played by Grant in his North London Treehouse Studio, The Crypt (London) and Angelic Studios in Banbury. Help at the controls came from Sam Miller & Brian Sperber at his Ansons Pocket Studio in Yorktown Heights, upstate New York. The idea to record a solo album, came about after Feeder's gig at the Brixton Academy in late 2012. 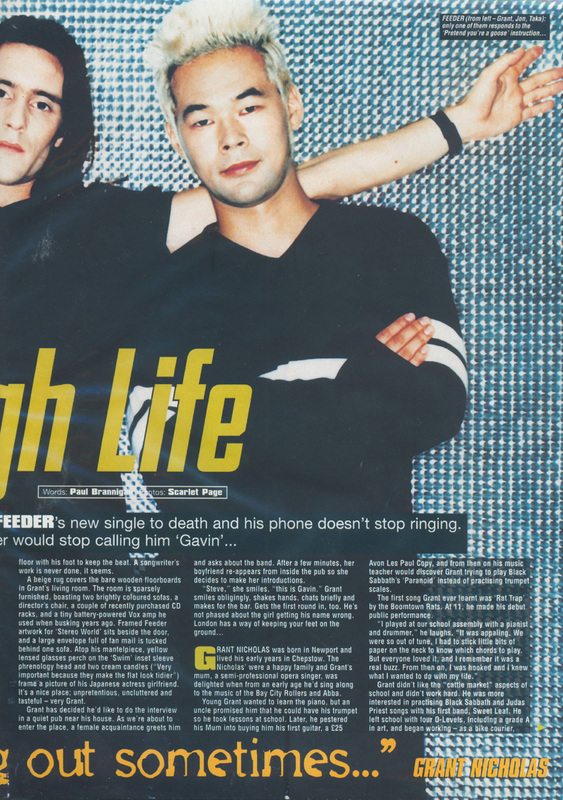 During this time Grant decided after 20 years without any time off, give Feeder a break for a short time while deciding to use the time to record and promote a solo album. After shows in July and June 2014 at The Slaughtered Lamb and Sebright Arms in London, Yorktown Heights charted at #29 on the UK album charts, which was seen as a success due to a lack of promotion from mainstream and alternative radio, while reviews mainly came from lesser known sources. After the release of the album, Grant continued to tour and played Fuji Rock festival Japan along the way. After ending 2014 with a show at the Islington Assembly Hall, Grant announced that due to the success of the album and supporting tour, alongside how much he's enjoyed the experience, more solo shows will be played in 2015. After the 2015 tour, a mini-album titled Black Clouds was released before the "Everyday Society" single was released for Record Store Day, bringing Grant's solo career to a close. Feeder later resumed activity with their 2016 album All Bright Electric, and 2017 compilation album which included new material on the supplement album Arrow. Both albums featured tracks originally intended for the solo album, but were re-recorded for Feeder ("Slint" and "Veins", which maintains the original vocal track). Some have yet to see the light of day, being "Rats" and "The Wall's Around Us". Nicholas has a Japanese wife named Kana. They had their first child, a girl named Hanna Sky, in 2005 and their second child, a boy named Ko Marley, in 2007. They live together in Crouch End, London. He is also follower of football and supports Arsenal F.C. although he also once admitted he does not follow the sport as much as his bandmates. Nicholas remixed the track "Ya Don't See The Signs" by the now defunct rap group Mark B and Blade, giving the rap a rock guitar background different from the original's hip hop sound. This was added as an extra track to their 2000 album, The Unknown. This version came to the fore when used for the opening credits of Sky Sports Saturday Morning show, Soccer AM. Nicholas spent the last few weeks of 2006 co-producing rock band EnjoyDestroy's debut album with Brian Sperber, who later split. Grant Nicholas was featured on an episode of Never Mind the Buzzcocks in 2008, his second appearance on the show after making his debut in 1999. In a Christmas special of the UK gameshow Pointless Celebrities, which was broadcast on 21 December 2013, Nicholas was a "Pointless answer" in a Band Aid 20 round. In which contestants had to identify from the official photo, participants on the recording. ^ Ankeny, Jason. "Biography: Feeder". Allmusic. Retrieved 23 July 2010. ^ "Descend FAQ". Descend. 15 March 2007. Archived from the original on 14 October 2007. ^ a b "Magazine cover article". Feederscrapbook.co.uk. Archived from the original on 5 November 2013. Retrieved 11 August 2014. ^ Avril, Cadden. "Feeder star Grant Nicholas reveals unlikely collaboration wishlist". Retrieved 11 July 2012. Wikimedia Commons has media related to Grant Nicholas. This page was last edited on 19 April 2019, at 10:48 (UTC).